I love maps. I don’t really understand them, and I’m not actually that good at using them, but I think they’re beautiful. They tell a story about how we think about our world, how we want it to look, where we see ourselves in connection with the rest of the world. This week’s topic for the American Studies class I’m teaching was “Geography and Population.” No big deal. An hour should be enough to cover that, right? Right. Last week’s role-playing of the American government system proved to be enjoyable and successful as a super-condensed lesson plan, so I wanted something simple and interactive for this week as well. 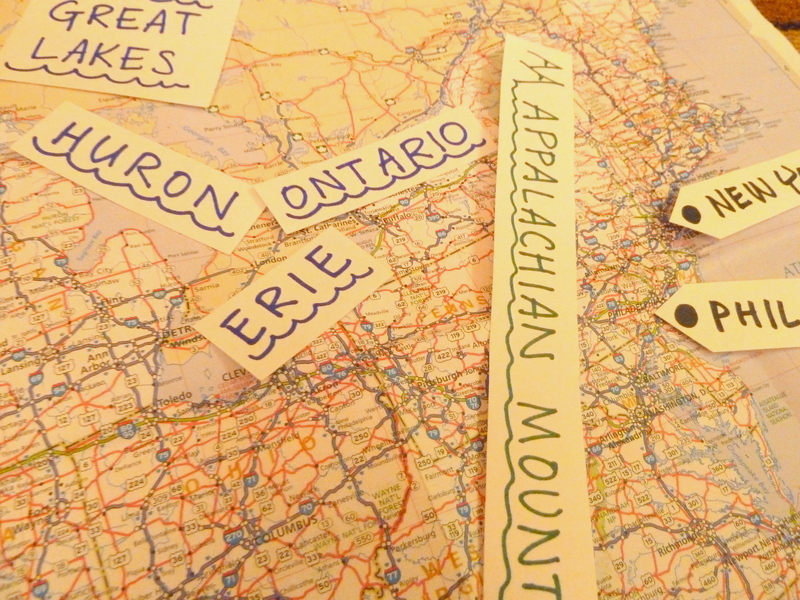 So I made a bunch of labels of major geographic features (Rocky Mountains, Lake Erie, Mojave Desert, etc.) and brought in my road map of the US, spread it out on a table, and invited them to gather around and figure out where everything went (with some help from me– one group guessed that the midwest was a forest). That went well, but did not take nearly as much time as I had anticipated, so I improvised by telling them stories about everything. I told them about how horrible driving in Boston is and about the bells along the Camino Real in California. I talked about migration west and Manifest Destiny by describing the Oregon Trail computer game. I wish I could reproduce for you the gesticulations and sound effects I used to demonstrate the Gold Rush. They got a kick out of Seward’s Folly, because most of them knew that Alaska was bought from Russia. They surprised me by what they didn’t know– and what they did. Some of them had never heard of the Rockies, but one guy had heard of Jesse James, and most of them knew more about Route 66 than I do (though I am prepared to attribute that to the restaurant in Arkhangelsk called Route 66). When we put down markers for the ten most populous cities in America, I took Los Angeles as a starting point for a story about my family’s geographic history, hopping from Arkansas to Denver to Pittsburgh, back to L.A., and then branching out to Oregon, Rhode Island, Illinois, New Mexico. They were really interested to see my family scattered across the map, but I think they were more interested because it was a story about me, a real person, instead of a list of facts about a monolith on the other side of the globe. And the questions they had! They all wanted to know, had I been to Niagara Falls? The Grand Canyon? New York City? One group asked what my favorite place in the United States was. Another group wanted to know more about the Native American genocide. I am loving this class. On the one hand, I surprised myself with how much history I spontaneously remembered (did not even look up Seward’s Folly on Wikipedia last night). But on the other hand, I am going to learn so much this semester. I am so jealous. That sounds like so much fun! Neat. I love your opening paragraph! Thanks Kait for sharing! greetings from a map-aficionado who is still lost in the wonderful, enigmatic world of maps for 20 years and still growing strong. Feels like I began studying them only yesterday. Time has a way of freezing when one is studying maps. Denis Wood, The Power of Maps, (New York and London: The Guilford Press, 1992), p. 4. Thanks, Karen! I’ll have to check out Denis Woods. Sounds like he has the same kind of whimsical poetic approach to his work that I aspire to. btw I love the rolling pics too! I was in Novgorod last July. Simply loved it.